Stock photo of the thundering Kakabeka Falls in Kakabeka Falls Provincial Park near Thunder Bay in Northern Ontario, Canada. Waterfall Kakabeka Falls near Thunder Bay in Ontario, Canada. Kakabeka Falls (aka Niagara of the North) along the Kaministiquia River during a spring flood, Kakabeka Falls Provincial Park near Thunder Bay, Ontario, Canada. 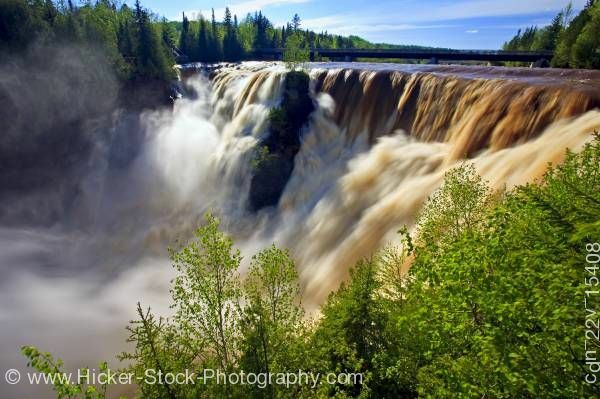 This stock photo of the Kakabeka Falls, which is also called "The Niagara of the North" shows the waterfall at high water in early spring on a sunny, blue sky day.